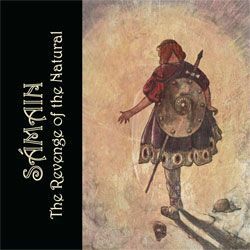 Sámain´s The Revenge of the Natural is a three-track conflict of battle-pitch rage, alienation and age-old Gaelic sorcery. Sámain´s Celtic black metal has been described as "fused massive, blackened and grinding constructions incorporating elder folk and progressive metal influences powered by the forces of birth, death and beyond". The aggressive sound and nature would be appreciated by fans of early Emperor or Enslaved, while also appealing to outside-the-box black metal fans generally. MCD release with a limitation of 500 copies completely remastered from the original cassette release of 1997.